Photo 01-02: Major Helmut Wick, Kommodore of JG2, wearing the Knight's Cross with Oak Leaves. Photo 01: The first award of the Oak Leaves went to General Dietl in July 1940 for his involvement in the capture of Narvik, so that after Molders and Galland, Helmut Wick was the fourth member of the German armed forces and the third member of the Luftwaffe to receive the Oak Leaves. Photo 01: The Oak Leaves were personally presented to Wick by the Fuhrer at Berchtesgarten on 6 October 1940. Images 01-02: A copy, left, of Wick's Geschwaderbefehl announcing his position as Kommodore of JG2 'Richthofen' with above right, a translation. Photo 01: This photograph of Goring, Jeschonnek and Wick was probably taken shortly before 14 November 1940, on which date Goring handed over temporary command of the Luftwaffe to Milch. Both Goring and Jeschonnek, centre, then went on extended leave. Note Goring's cuff title which was worn to commemorate the tradition of Goring's First World War unit and reads 'Jagdgeschwader Frhr. v. Richthofen Nr.1 1917/18'. Erich Leie and Helmut Wick were close friends; Leie was flying as his Rottenflieger on 28 November when Wick went missing. F/Lt John Charles Dundas of 609Sqn., the pilot who is believed to have shot down Wick and who was himself then shot down by Obit. Rudolf Pflanz. Photo 01: After the death of Major Wick at the end of November 1940, command of JG2 passed to Wilhelm Balthasar, although confirmation of his position as Kommodore was not announced until February 1941. 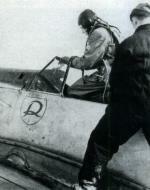 Early in the war, Balthasar is believed to have adopted a personal emblem of three wasps, but in this photograph taken in December 1940, the first letter of his surname, a letter 'B', has been painted below his cockpit. Note that the 'Richthofen' shield has been applied in outline form directly onto the camouflage fmish and lacks the more usual coloured background. Photo 01: A mechanic reloading the ammunition tanks on one of JG2's Bf 109E-4s, mid-August 1940. Each ammunition tank held 1000 rounds for each of the two 7.9 mm MG 17 machine guns mounted on the engine crankcase. Also visible in the wing leading edge is one of the two 20 mm MGIFF cannon carried by the Bf 109E-3 and E-4, each with 60 rounds per gun. Photo 01-02: A close-up view of the cockpit and spinner areas of a force-landed Bf 109E-3 of JG2 clearly showing the heavily applied green (RLM 70) brush or sponge stipple that was beginning to be applied by the ground crews of this unit at this time. The aircraft was damaged by machine gun bullets which penetrated the engine and cockpit side panels. The broken plexi-glass shows how thin and vulnerable the material was which led to an additional armoured glass panel being applied to the front windscreen on many aircraft. Note part of the JG2 'Richthofen Geschwader badge below the cockpit which has been crudely stippled around. Photo 01: A Schwarm of yellow nosed Bf 109Es from JG2 fly north along the coast of France near Cap Gris-Nez. Most Luftwaffe aircrew, and especially pilots of single-engined aircraft, greatly disliked flying over the Channel. Photo 01: This photograph illustrates the uneven retraction cycle of the main undercarriage of a Bf 109E-4 of JG2 as it takes off from Cherbourg-Theville during mid-August. Photo's 01-02: Two photographs showing a visiting He-111 landing at JG2's airfield at Octeville in early August 1940. Of note on the JG2 Bf 109 in the foreground, is the heavily applied 'stipple' mottling over the RLM 65 on the fuselage side and the motor car type rear view mirror mounted on the canopy framework.